When you want to see the latest version of a web page in Internet Explorer, you are already accustomed to either using the F5 keyboard shortcut (or Ctrl+R), or pressing the reload button inside or next to the address bar, depending on the version of Internet Explorer you are using. In Internet Explorer 7 and Internet Explorer 8, which both support "tabbed browsing", you have the option of refreshing refresh all tabs at the same time! Since the alternative is to cycle through each web browser tab manually, and reload its content, knowing about the reload-all-tabs command can be quite useful, whether you are frantically following an election in progress, or online auctions about to come to an end. 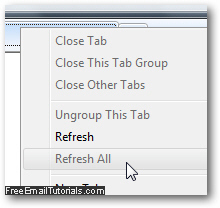 Going back to an Internet Explorer window that has several browser tabs opened, just right-click on any of the tabs you see in that window, and choose "Refresh All" from the context menu. All tabs all of a sudden start reloading their content simultaneously, the spinning icon is visible in all tabs until they have finished refreshing: a few high-profile news sites with graphic-rich interfaces are a good way to test this feature. Depending on the number of tabs you have open in the current Internet Explorer window, the speed of your connection, the sites you have loaded (is it just fast-loading text, or a "heavy" page like a YouTube video or image-filled web page?) - based on all these variables, refreshing all tabs at the same time can bring your computer to a screeching halt for a few seconds - use with care!